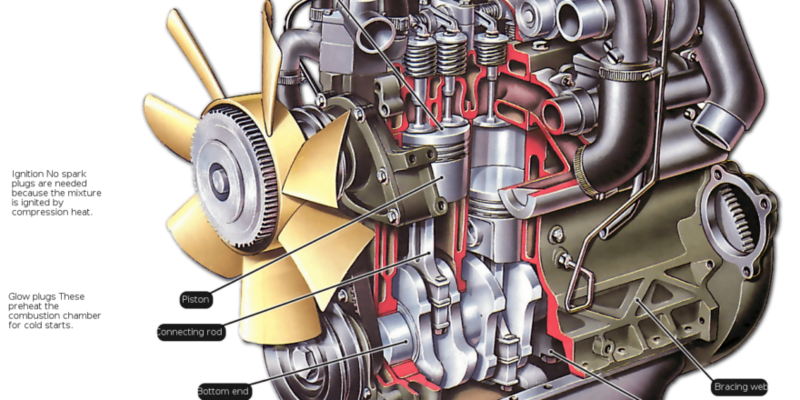 A majority of people are used to working with gasoline engines than diesel, but one way to begin understanding how diesel engines operate is to examine the similarities between the two types of engines. First, the type of fuel burned by either doesn’t affect the overall makeup of the engine. The fact is they’re actually structurally very similar overall. One key difference is the role of airflow, which is vital in a gasoline engine, while it’s far from it in diesel engines. Four-stroke, intercooled, and turbocharged diesel engines take air in through the compressor housing on the intake side of the turbocharger, where the air is compressed within the compressor wheel to create boost. Air becomes much warmer and denser. The air then travels through a charge air cooler, or intercooler, where the temperature lowers as it travels through to the engine, with little loss of boost. Things truly get interesting once the compressed air is forced in-cylinder. Throughout the intake stroke, where the piston is dropping to the bottom of its range, the valves open to allow unthrottled air to fill the cylinder. Then the intake valves close and compression strokes begin. The air then travels upward and, under significant pressure, heats up to over 400 degrees Fahrenheit, which is sufficient to cause the diesel fuel to ignite by itself. Then that is exactly what happens, as a shot of diesel fuel meets with the super-heated air and combustion occurs. The last step of the process involves the exhaust stroke, where spent combustion gasses are expelled through exhaust valves and exhaust manifold, where it then goes into the turbine side of the turbochargers. In your average gasoline-powered engine, no turbocharger exists, which means once out of the engine, exhaust gasses immediately head for the tailpipe. This is not so in a diesel, as the turbocharger, which is in charge of forcing fresh air into the engine, actually uses the exhaust gasses leaving it to drive itself. This is one of the key differences between diesel and gasoline engines. The fact that such extreme pressures, long strokes, and high levels of boost occur throughout the ignition process means that heavy-duty parts are needed. This is why these engines utilize durable parts. To withstand the tremendous stresses imposed on them, manufacturers use things like deep-skirt cast-iron blocks, forged-steel crankshafts and connecting rods, and typically use cylinder heads with at least 6 head bolts per cylinder. All-steel pistons even get the nod in plenty of Class 8 diesel parts.